A few weeks ago Mizuho and I enjoyed a (very) rare night out, and headed, inevitably, for Chinatown (the only game in town). 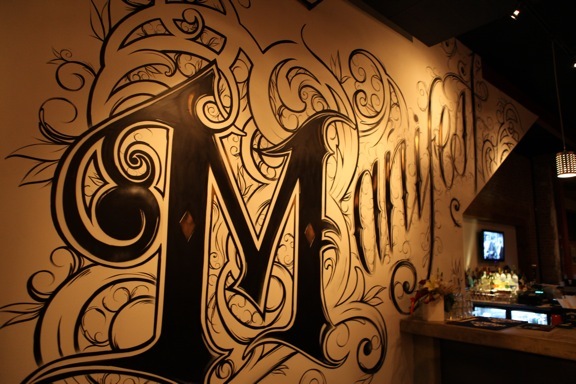 We decided to check out Manifest, one of a few significant new openings in the past year. It’s a beautiful spot, the kind of space that Honolulu needs even more of. A comfortable blend of cafe, bar and gallery. A sense of style, but not unapproachable. I had to order a Mojito to see how it measured up against 39 Hotel‘s masterful rendition. It didn’t, but was good enough. There was a white reggae artist (you know the guy, dreads and a fondness for Jah – he’s everywhere) strumming out some very kind BGM. Not much of a crowd, but it was a Saturday and we were out early. Go there. ← Attack of the iPhone Killer Robots!